When visiting this site you may notice an absence of recent news and information. We have uploaded two new photo albums to the website. The first is pictures from the recent camp at Whiteley Woods Sheffield and the second is pictures from the Ultimate Coast to Coast bike challenge which took place on the 16th of October. Thanks top all those who took part in the challenge, helping to reach a total distance of 319 miles. The sponsor money is not all in yet but early indications look good. Rest assured that the mony raised will be used to fund future events, activities and equipment. The Coast to Coast Walk from St Bees Head on the West Coast of England to Robin Hoods Bay on the East was devised and made famous by Alfred Wainwright. The route stretches for 200 miles across some of Northern England most beautiful countryside. In 2010 I completed the walk in 12 days. I now Challenge all New Mill Cubs and Beavers to equal or better that distance in one afternoon. 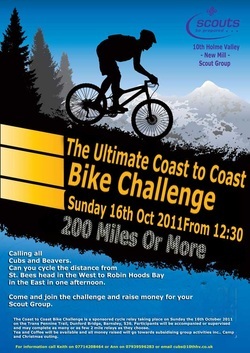 The Ultimate Coast to Coast Bike Challenge will take place on the afternoon of Sunday 16th October 2011. The Ultimate Coast to Coast Bike Challenge is a sponsored bike relay taking place on Sunday the 16th of October 2011. Participants can commence the challenge at any time between 1230pm and 2pm. The challenge will end at 3.30pm. The event will take place on the Trans Pennine Trail at Dunford Bridge nr Winscar Reservior above Hade Edge. The Challenge is for Cubs and Beavers to complete as many 2 mile relays on the trail as they can, with the combined total of all participants equaling 200 miles or more. However everyone is welcome to join in. There will be a marshall on the trail 1 mile from the start to turn participants around. Cubs and Beavers can take part in small groups or with other family members. All participants will receive a certificate and Beavers who complete 4 miles and cubs who complete 6 miles or more will receive an exclusive Ultimate C2C Bike Challenge T-shirt. Tea and Coffee will be available, plus hot dogs for cubs and beavers. All money raised will support group camps outings and activities. St Georges Day is important in Scouting as St George is the Patron Saint of Scouts. All Beavers Cubs and Scouts are expected to attend the Parade and service. This years parade is in Meltham. opposite the 5th Holme Valley Scout HQ in St James' car park, which is a short walk away from Meltham Hall Park. The Parade will set off at 1.45pm to arrive at St Bartholomews in the centre of the village at 2pm and parade back to Meltham Scout HQ for 3pm where refreshments will be served for those taking part. Children should be smartly turned out in full uniform with scout or school trousers. Parents should collect at 3.15pm - 3.30pm. Over the weekend of 26th - 28th November the 10th Holme Valley - New Mill - Cubs and Beavers enjoyed their first winter camp. The venue was the Charles Wilson building at Bradley Wood. Although this was a winter camp, there were a few luxuries including, bunks with mattresses, central heating, hot water (not used by the cubs) and lots of fabulous food courtesy of the "Galley Crew". They then set off on a wide game to find 26 items of pirate booty hanging in the trees and bushes around the site, followed by flag and bandana making, supper and a fire. Saturday started late for camp at 7am, the camp site had turned into a winter wonderland thanks to a dusting of snow in the night. After a good breakfast the cubs got to try climbing and shooting. At lunch time the Beavers joined camp and then everyone swapped, climbers shooting and vice-versa. Before tea we went to the Jubilee Center to play some games - we hope to put a video of the hilarious game "Lifeguard" on the we for you to view. Whilst we had been busy the Galley Crew had cooked up a lovely pasta and bolognese tea which we followed with another wide game, some crafts and then a few quiet games before a slightly earlier bed. Sunday started even later - 8am is a first for camp. I still shudder when I think of 4am football on summer camp. Anyway, after another lovely breakfast we held a brief scouts own before more fun activities. All too soon camp was over and it was time to go home. The scores for each team were collected based on wide games, crafts (flag making), turnout, room inspections and a picture trail. Team J.O.J.J. romped home wing with 39 points thanks mainly to good turnout at the scouts own followed by all other teams gaining around 26 points each.